NSW Minister for the Environment, the Hon Mark Speakman, recently launched a new publication about the amazing natural and cultural values of the Greater Blue Mountains. The Greater Blue Mountains was originally nominated to the World Heritage List for both natural and cultural values, but was only inscribed for natural values related to Eucalyptus plant communities and rare species. The area is included on Australia’s National Heritage List for the same reasons. Over the last 15 years understanding of the many values of the Greater Blue Mountains has grown, ranging between extraordinary geology to amazing galleries of rock art and contemporary Indigenous culture. It is fitting that these and other values are now formally recognised, both nationally and internationally. The Australian Heritage Council is re-assessing the Greater Blue Mountains for these additional values. The Greater Blue Mountains World Heritage Area Advisory Committee has shared the expertise and experience of its members across a range of disciplines to assist with this re-assessment. More than a year ago, current and former members of the Advisory Committee prepared a series of expert papers about this extraordinary place. The Advisory Committee has now published this information so that it can be readily accessible to students, managers, researchers, and anyone else who is interested in the Greater Blue Mountains. 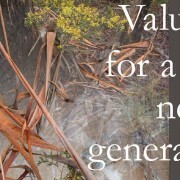 Greater Blue Mountains World Heritage Area: Values for a New Generation is available in both printed form and online here. The book presents engaging and informative papers on geodiversity, contemporary Aboriginal culture, epic history, the interaction between nature and culture and, of course sublime panoramas and scenic grandeur. I wish to acknowledge the contribution of Prof Richard Mackay, who having served since the original appointment of the Committee; the last 5 years as its Chair, will step down at the end of this year. Richard enjoys an international reputation in heritage management, and is currently a cultural heritage adviser to the World Heritage Committee. The World Heritage Area is fortunate to have reaped the benefits of his energy, clear thinking and persuasive, values-based approach. The Blue Mountains Gazette published two stories about the celebration and the Values book. The Greater Blue Mountains extends across the traditional lands of the Darug, Darkinjung, Gundungurra, Tharawal, Wonarua and Waradjeri peoples. Mackay Strategic enjoyed some recent press coverage, courtesy of Richard Mackay’s business card and the Sydney Morning Herald’s Column 8. While Richard himself denies ever sending his card to the paper, he does confess to being an inveterate issuer of business cards! Column 8 came across a business card in our wallet this morning, with no clue as to how it got there, (we all have cards like that, found days, weeks, or even months after the event), of a certain “Prof Richard Mackay, AM”. All well and good but the job description under Richard’s name intrigued us: “Director of Possibilities”. We considered calling the number, but hesitated. Who knows what might have happened had we done so. 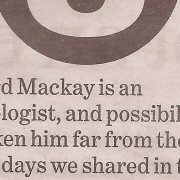 Richard Mackay’s business card (“Director of Possibilities”, Column 8 since Monday), has been outdone . . . Indeed, the possibilities seem endless . . .
Richard Mackay was the Australian delegate at a recent cultural tourism workshop hosted in Pedang, Sumatra, by the Indian Ocean Rim Association. The Indian Ocean Rim Association (IORA) is an international organisation comprising 20 coastal states bordering the Indian Ocean, which seeks to promote regional co-operation in government, business and academia. IORA focuses particularly on trade facilitation, investment, promotion and social development. The Chair of IORA recently passed from Australia to Indonesia and the cultural tourism workshop was convened by Indonesia to consider how member nations may share information and otherwise foster this fast-growing area of tourist activity in the region. Participants in the workshop included delegates from Bangladesh, India, Iran, Indonesia, Mauritius, Seychelles, Sri Lanka and Thailand. One highlight of the event was a visit to Sinjunjung; a Sumatran village with distinctive timber architecture and continuing traditional culture, which has been nominated to the World Heritage List. Workshop delegates were treated to a civic reception, village tour, cultural performances and splendid local cuisine. As the Australian delegate, Richard presented the ‘Angkor Tourism Management Plan’, focusing particularly on how cultural tourism can provide benefits to local communities, by creating sustainable livelihoods and connecting local people directly with the economic benefits that flow from tourism. The Angkor work was undertaken by GML Heritage for UNESCO and the Royal Government of Cambodia with support from the Australian Government. The IORA cultural tourism workshop recognised that in some countries like Australia and Thailand, there is already a vibrant cultural tourism industry, while other nations like Seychelles and Mauritius have wonderful and unique experiences to offer. The workshop identified opportunities for facilitating cultural tourism in the region through shared experience and both research and ‘hands-on’ programs.